Congressman K. Michael Conaway represents Texas' 11th Congressional District, consisting of 36 counties in Central and West Texas. Since his election in 2005, Conaway has brought a forward thinking, common-sense approach to Congress and has earned the reputation as "a voice of reason" in Washington. A native Texan, Conaway grew up in Odessa, graduating from Odessa Permian High School in 1966 after playing on Permian's first state championship football team. He graduated from Texas A & M University-Commerce in 1970 with a BBA degree in Accounting. After serving in the Army at Fort Hood, Conaway resumed his career with Price Waterhouse & Co., one of the largest accounting firms in the world. He returned to the Permian Basin with Price Waterhouse and settled in Midland where he later worked with George W. Bush as the Chief Financial Officer for Bush Exploration. In 1995, Governor Bush appointed Conaway to the Texas State Board of Public Accountancy, a state regulatory agency that regulates the practice of accountancy in Texas. 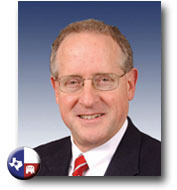 Conaway volunteered his time to serve the citizens of Texas on the board for seven years, including more than five years as Chairman in which he played a role in writing regulations and dealt actively with local, state, and federal officials. Conaway believes that each Texan has a responsibility to make our communities stronger. He has given countless hours as a volunteer in our communities, working jointly with Texas charities on numerous boards and organizations. In 1990, he was named "Volunteer of the Decade" by the Community Services branch of the Midland YMCA. Conaway's background as a CPA has given him the credibility to be a vocal proponent in reducing the national debt. As a small business owner Conaway knows the burden excessive regulation, expansive government, and taxes put on the American family and small businesses. Conaway has advocated for a simpler and fairer tax system and has sponsored legislation that would bring more accountability in government funding. In the 109th Congress he won the Ronald Reagan Award for showing exemplary leadership in communicating the need for Social Security and Medicare reform. Conaway currently serves on the House Agriculture, Armed Services, and Budget Committees. As a member of the Armed Services Committee he supports the goals of the Global War Against Islamic Jihadists and the men and women in the armed forces. On the Agriculture Committee Conaway works to protect the interests of rural America and the American farmer in the Farm Bill. He also serves on the Republican Policy Committee which helps good ideas become good legislation. An ordained deacon in the Baptist Church, Conaway is a committed volunteer, small businessman, and devoted husband and father. He and his wife, Suzanne currently live in Midland, Texas.